Calling all students entering 6th, 7th, 8th and 9th grade in the fall!!! 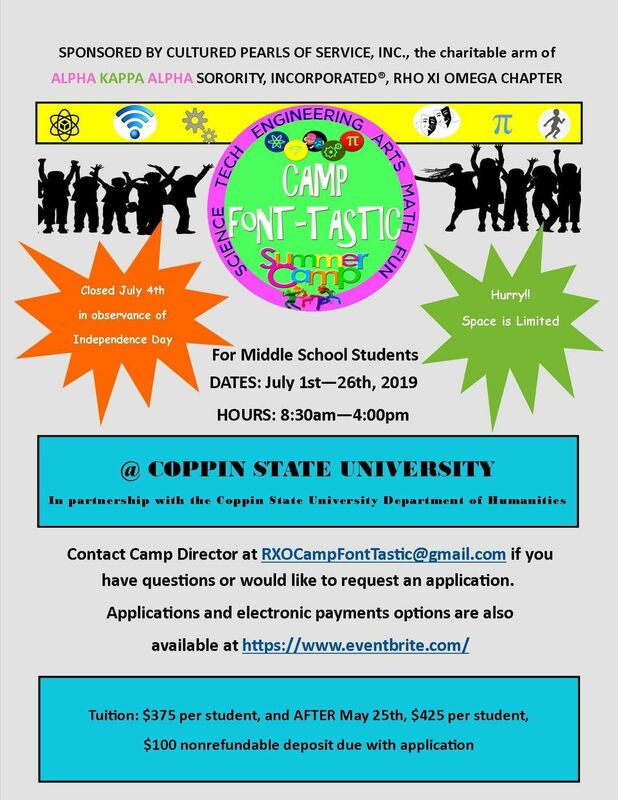 Join Alpha Kappa Alpha Sorority, Incorporated, Rho Xi Omega chapter and its charitable arm, Cultured Pearls of Service, as we host our annual summer program, Camp Font-Tastic 2019, in partnership with the Coppin State University Humanities Department! Allow us to keep your scholar engaged over the long summer with four exciting and interactive weeks of science, technology, engineering, math, theater classes, trips, and fun! 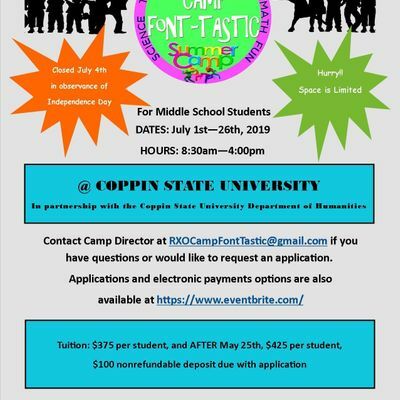 Camp will be held at beautiful Coppin State University, Monday through Friday, from 8:30am to 4:00pm, July 1st -26th. Youth will take field trips every Friday (cost already included in camp fees with the exception of one trip at an additional cost). We also provide lunch Monday-Thursday; however, students must bring lunch on Field Trip Fridays. Tuition for the program is $375 per student when paid by May 24th and $425 per student if paid after May 24th. A nonrefundable $100 deposit is due with the application and final payment must be made at orientation. Please contact the Camp Director at UlhPQ2FtcEZvbnRUYXN0aWMgfCBnbWFpbCAhIGNvbQ== with any questions. We look forward to providing your youth with an exciting summer program!